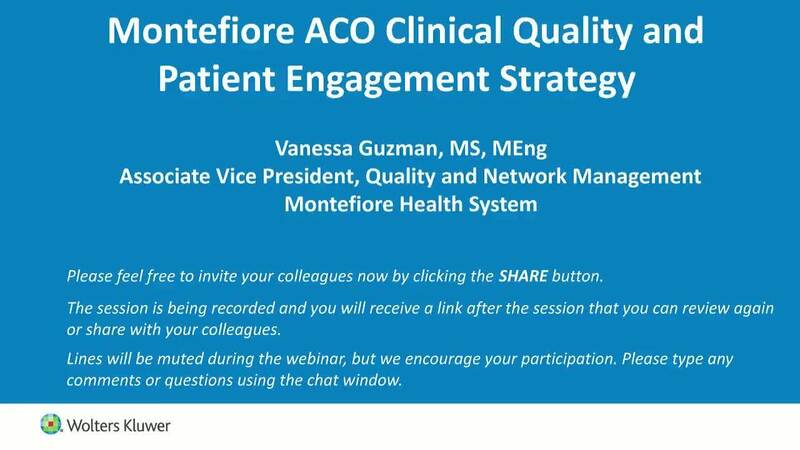 In this webinar, Vanessa Guzman, Associate Vice President of Quality and Network Management at Montefiore Health System, explains how the system uses Emmi programs as the basic infrastructure to support its patient engagement strategy. With 11 hospitals and 400,000 patients covered under risk arrangements, Montefiore has built its Next Gen ACO population-health strategy around Emmi capabilities. “The volume of patients you can reach with Emmi is impressive. You will never be able to accomplish the volume in the time frame with every single human resource in the world. Moderating the one-hour web conversation is Pam Holt, RN, BSN, MOL, operational consultant for patient engagement with Clinical Effectiveness at Wolters Kluwer, Health. This webinar is organized by Wolters Kluwer, the maker of Emmi patient programs, Lexicomp®, Medi-Span®, and UpToDate®.